Buy Rise of the Tomb Raider for PS4 at best price has never been easier! Now you can preorder Rise of the Tomb Raider for PS4 in any of the online stores that we have selected for you. 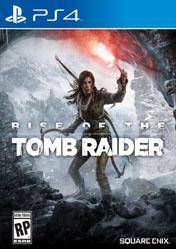 Since Gocdkeys you will see a price comparison, ordered from smallest to largest price, where you can choose the best possible price for Rise of the Tomb Raider PS4, in the best online stores. New installment of the famous heroine, which will undertake a journey to the most remote and dangerous places in search of the secret of immortality. For this task, we will have all the survival skills and resources available. Do not forget that in the area where this secrecy is, jealously protects nature, so Lara must withstand harsh conditions and unstable environments, in addition to face a dangerous wildlife which acts as guardian of ancient tombs. The tombs are now huge ancient and riddled spaces with deadly traps full of exciting puzzles and ancient texts. During the fighting we can use the environment to our advantage, climbing trees or dive into the water to avoid the enemies. We can configure the equipment, weapons and ammunition to suit our own style of play. We can create explosives and wield the battle bow to bring down our enemies. All stores appearing in gocdkeys have been tested by our team so they are 100% reliable, even so, we recommended you read carefully the specifications in each store about the time of shipping, ways of activation (in case it is digital) and methods of payment. Really amazing Tomb Raider game, some people have bad critics for this game but I liked it, if you like adventure and 3rd person shooter you will like this game.